Understandably, many people get energized and excited at the top of the New Year to make changes and updates in their lives. For me, I always get a renewed sense of energy as I feel spring approaching. 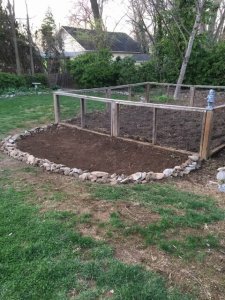 Perhaps it’s seeing the gardens awake, and feeling the warmth of the sun grow stronger as we inch closer to the spring equinox that sets me stirring, but I start to look for new ideas and new projects to take on. Now that I am watching the vestiges of what will (hopefully!) be the last snow disappear, the spring renewal has me itching to get to work! As such, we are very excited to announce the launch of our updated online booking platform. I know a lot of you prefer just giving me a call to make your reservations, and we love that! For dedicated online bookers and for first time guests finding us, however, I really feel like this new system will be much easier and more intuitive to use. It’s also an opportunity to highlight some of the “extras” that we offer to enhance stays. For these additions, we work hard to collaborate with local vendors. 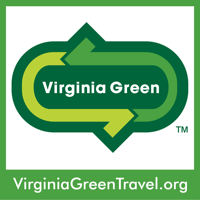 That way, our guests get the best of everything that Berryville and the surrounding area has to offer. 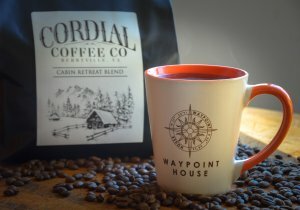 As a prime example, we are now very proudly serving locally roasted Cordial Coffee at breakfast. Additionally, we offer a new Wake Up Package featuring a bag of their freshly roasted beans. It’s a great way to bring a taste of Berryville home with you after your stay. Just how local is this locally roasted coffee, you ask? Just two blocks away! That pretty much guarantees a fresh, tasty cup of coffee in the morning! 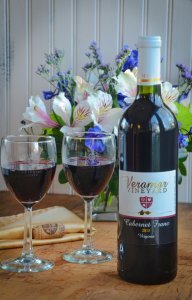 Veramar Vineyards has been our purveyor of choice for the wines we serve with our in-room packages for years. Now it’s even easier to add a wine package to your reservation with the new booking system. Celebrating a birthday or anniversary during your stay with us? 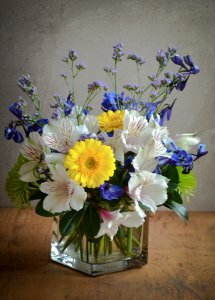 We can offer a unique floral arrangement designed exclusively for Waypoint House from our local florist. 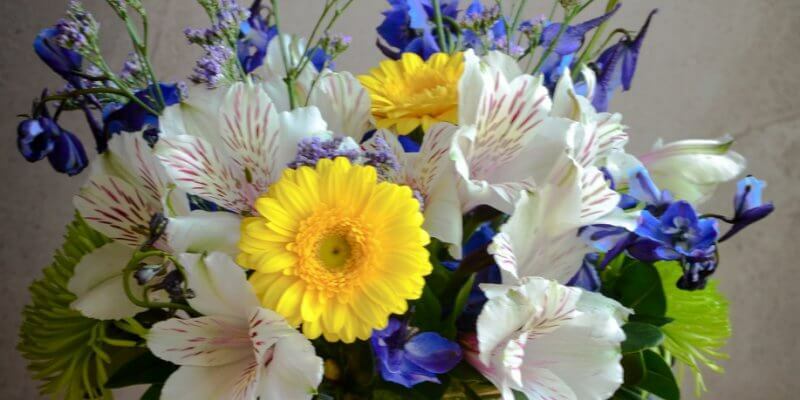 Just ask for the Blue Ridge Bouquet when booking your reservation over the phone. 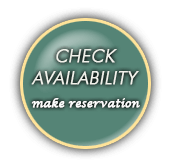 It can also be added to a reservation from the extras section while booking online. 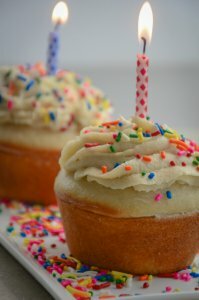 We’ve even created a package to bring you house made birthday cupcakes! 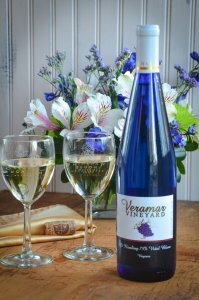 And if you need something really special for a celebration, we are excited to be able to bring you a premium, local, Virginia sparkling wine. 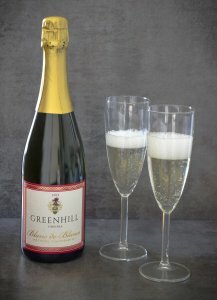 Greenhill Winery and Vineyards’ Blanc de Blancs is available as a package add on. We invite you to take a look at our newly updated Promotions, Specials and Extras page to see all the details. 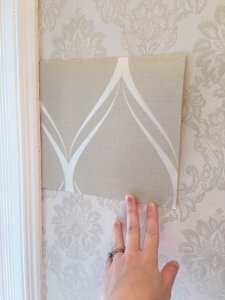 It took two weeks from start to finish, but we are ready to show the big reveal of our wallpaper project! First, I have to give a very big thanks to Terry Ashby of The Cutting Edge wallpaper service. 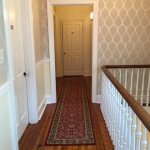 Thanks to him, the process was easy and efficient, and we are so pleased with the results! 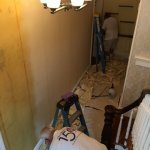 One of our worries upon starting this project was how the old wallpaper would come down. I’ve done quite a bit of wallpaper removal myself, and you just never know how the process will go. 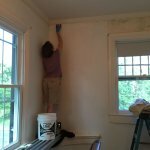 I was fairly confident that most of what was on plaster walls would come down just fine. We knew there were several drywall additions, though, and I was suspicious that at least one area had multiple layers of paper to get through. In just two days, though, all the walls were ready for priming. Jonathan and I tackled that chore. Once that was done, we also painted the bottom half of the walls with the new color we had already selected. We knew it was important to get all of out painting done ahead of the paper installation. That way, there was no need to worry about painting near, or splattering on, the new wall covering. 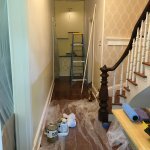 Putting on the prime coat – Yes, that’s a scary corner to paint! Terry and crew were able to install like the wind after that. In just two and a half days, they transformed the space. Finally, my in-house carpenter (AKA, Jonathan) was able to install the chair railing, and just like that, our lovely lady now looks stunning in her new dress! Here’s the big reveal – Welcome to our new front hallway! In other news, there continues to be great progress on the new roof. We’ve only lost a couple of days of work due to poor weather, and the crew is currently working on the south side of the house which will be the easiest section as there are no angles or valleys to contend with. 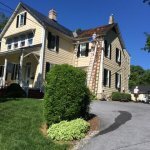 I’m still very eager for the copper accent roof on the bay window to go on, but I know my patience will be rewarded, and I’m looking forward to sharing that update with everyone soon. It’s been a very exciting first two weeks of June, and today is a very special day for us. Today we are celebrating our five-year anniversary and our June improvements are underway! Yes, that’s right, it’s already been five years here at Waypoint House and we still love every minute of it. By itself, that’s a pretty big deal this week, but also we’re right in the middle of our planned June improvement projects. Aside from the little hint I gave you in the last blog, we are also undertaking having the roof replaced – a new hat for our old girl, as we like to say. 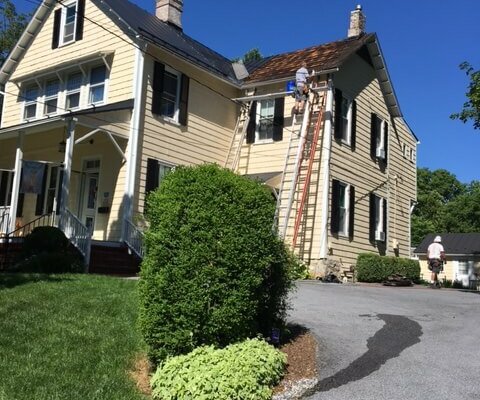 Ironclad Contracting has been on the scene taking the old roof off section by section and re-installing our beautiful new standing seam metal roof. We are already so pleased with the progress. 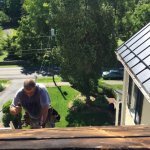 The cherry on top will be when our side bay window receives a new copper roof that we think is going to be a really spectacular accent. I can’t wait until I have photos of that to show you! It will be the last thing the contractor does, so we must be patient for a few more weeks. The interior work is underway as well. 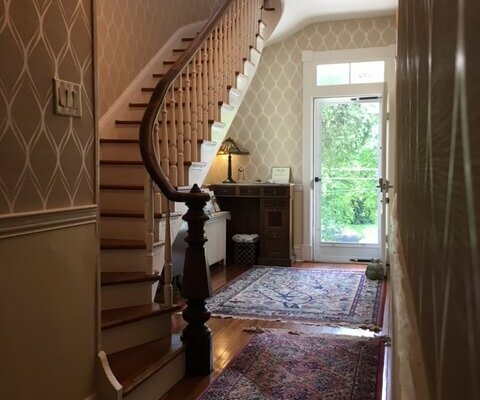 The front hallway, stairwell and second floor hallway will have all the wallpaper replaced. 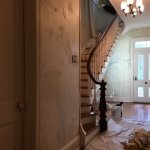 We will install chair rail molding and paint the bottom portion of the walls. Jonathan has already primed and painted the molding for installation and today the wallpaper removal process started. 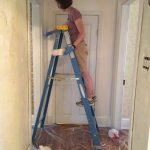 I’m also doing some touch up painting on the second floor hallway doors and trim so that everything has a nice, clean, polished look. 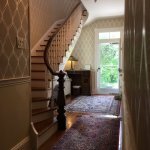 We’re calling the wallpaper project the new “dress” for our dear girl! So, a new hat and a new dress for our lovely lady as we celebrate our five year anniversary – not too shabby! Stay tuned for more updates as progress continues! 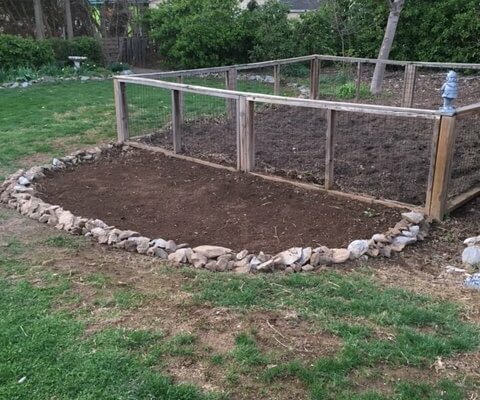 Spring finally seems to be arriving and we’ve been working on some spring rejuvenations. The days are warmer and we get an extra bit of time each evening before the sun goes down to complete our outside chores (of which there are many this time of year). As you may know, we have a tendency to be involved in some sort of home improvement project on a nearly ongoing basis. Whether it’s outside or inside, we’re almost constantly working on something. We can’t help it. We’re compulsive. We just want to continually make things better. Early on, Jonathan and I had this instilled in us. For me, perhaps, my 4-H days are partially to blame. Any former 4-H kids out there remember the 4-H motto? *Raises hand with enthusiasm as only a nerd at heart would do. * “To make the best better.” Yep, that’s us. The most exciting news, however, is that we have two very big projects planned for this summer. Big in scope and big presence. These changes will be zingers. We’re going to need a little time off to accomplish it all though. We are planning to keep the work mostly to weekdays in the month of June, so if you are considering a weekend visit this summer, we still have you covered. Plan ahead though, folks. 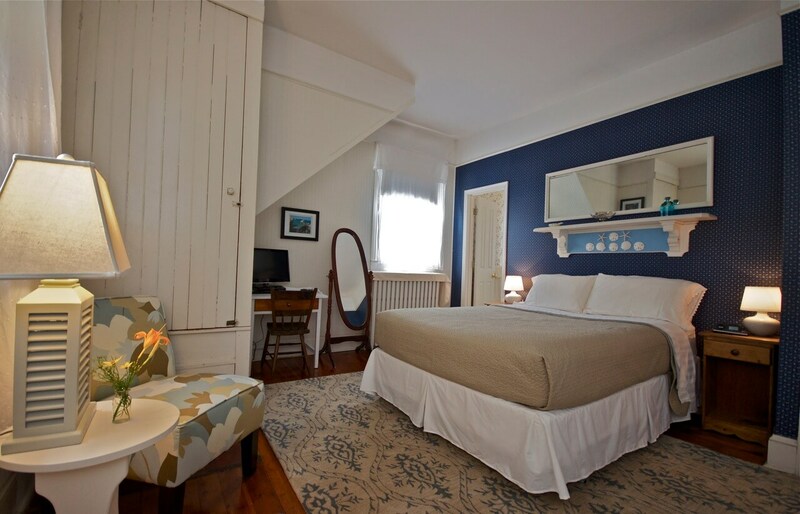 With three rooms, we tend to fill fast. There will be lots of photos and updates through the blog, Facebook and Instagram. If you don’t follow us on either social media platform, now would be a good time to start. Links to our social media pages are in the sidebar of this page. Go have a gander. We made it! We worked up until the very last day, but were ready for our re-opening on December 30, and graciously welcomed our guests! 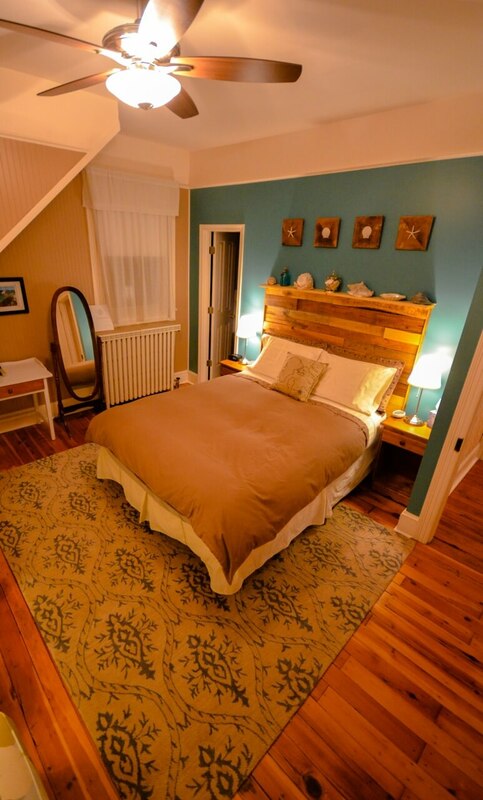 What a delight to finally make our renovation reveal! We had a terrific New Year’s Eve and served a delicious breakfast the next morning to a boisterous crowd around the breakfast table. We are so grateful and would like to wish everyone a very happy 2014! Come visit us this year! I’ll have more photos to post in the days to come, and of course the room pages on the website will be updated, but I know Jonathan is going to want to obsess over just the right angle and just the right lighting for a while! For now, here is a photo of the updated Shore Room, which is the one I have been dying to show you all. Replaced valves to all radiators so all of them now function! Repainted Shore Room, top to bottom. Re-positioned ceiling fan junction box to center of room in Shore Room, removed old ceiling fan and replaced with a new ceiling fan. Quite a list when you look at it that way! We are looking forward to a great birthday year for the house. We think we gave her a good start and we look forward to having everyone come visit us soon so you can see all of this for yourselves. I’ll keep posting in the weeks to come. We have a few more details to finish out (remember those new lighting fixtures for the Traveler’s Retreat bathroom I mentioned?) so stick around. It’s going to be a great year!